The tent on the left is the worst single-person tent in the world. The one on the right is the best one. The worst tent is from REI. Setting it up is like wrestling with a Mechano/Erector set on crystal meth. 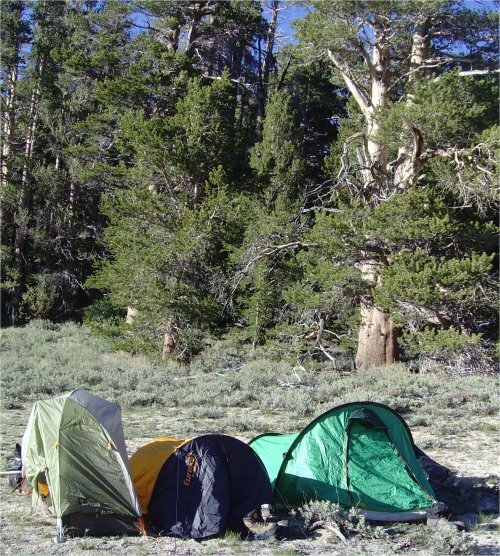 It is IMPOSSIBLE for one person to set up in the sorts of moderate winds that prowl the upper elevations of the Eastern Sierra above 10,000 feet (places I backpack most). Note the aerodynamic flying characteristics (below) as it sails away in a slight breeze in the Silver King Valley a couple of weeks ago. As I ducked to avoid being hit, I did have to admire what a nice kite it made. Stiff breezes the night below permanently bent two of the aluminum support rods. No wonder the tent comes with a piece of tubing to repair rod breaks. Set up is complicated by the fact that there are at least eight stakes needed to properly secure tent and rain fly. Total weight of tent and stakes, 3 lbs, 10 oz. 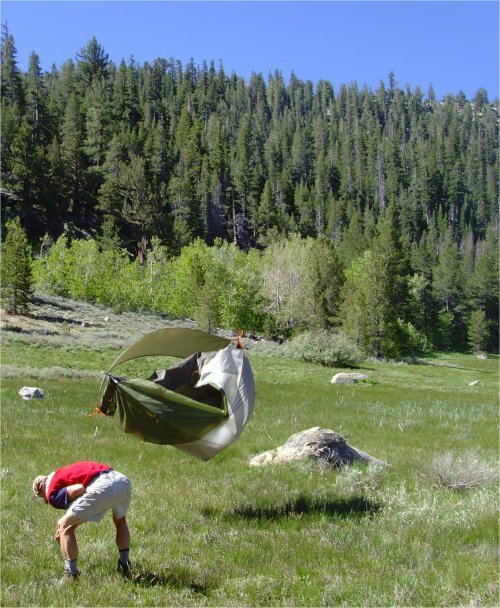 Given the fact that, above the tree line, driving ONE tent stake is often impossible. We frequently have to use rocks stacked over the stake loops instead. I contemplated simply burning the tent rather than hauling its worthless weight out of the Silver King Valley. But we were in the Carson-Iceberg Wilderness area (just over the hill from the Marine Corps Mountain Warfare Training Facility) and I figured that the fire would violate a dozen federal regulations. However, I'd also feel guilty about re-selling it at REI's used equipment sale or even giving it away. So, I will burn it this summer in the back yard and post the video. It sets up with two flexible fiberglass rods (in great shape after 35 hard years) and three stakes. 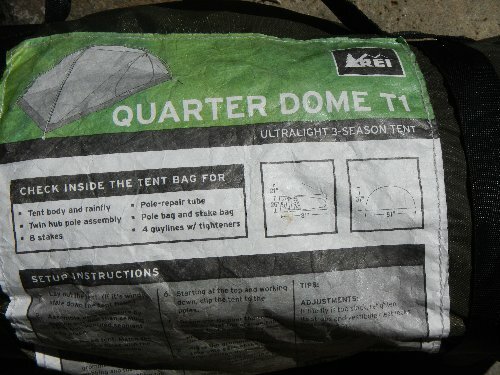 It's the first tent ever made of Gore-Tex which was brand new back then. Gore-Tex meant that it did not need a separate rain fly. That massively simplified set-up. Total weight including stakes and recent duct tape repairs, 3 lbs, 12 oz. Among other places, I backpacked all over Alaska with this tent. It got its baddest test when I hiked the Chilkoot Trail in mid-September 1977. Started out in a pouring rain. Climbed and scrambled over boulders the size of a Buick in a rain/snow mix. By the time I got to the top of the pass and entered the Yukon Territory, the snow was driven by a howling wind that blew alternating white-outs. A little farther along in the Yukon, I camped for the night at a misnamed place called Happy Camp. In the middle of rain and snow that the wind was blowing almost sideways, I had no problem pitching the Early Winters tent in about five minutes. And snuggled down for the night. Warm. Dry. Four or five years ago, my son, William, co-opted the Early Winters, thus leaving me in the search for a replacement. 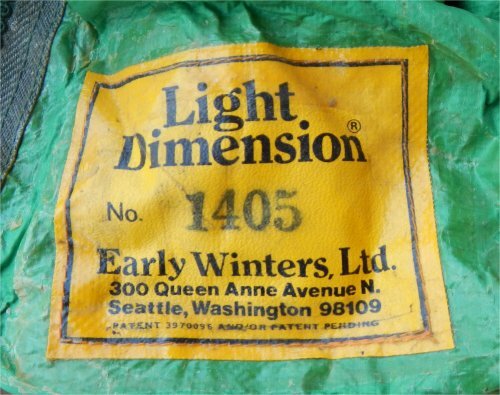 Sadly, after 35 years, this tent started to leak last year. And this year, needed duct tape repairs at Silver King. The tent in the middle of the first image, above, is daughter Katherine's tent (for now). If the REI tent has satisfaction level of -100 and the Early Winters is a 100, Kate's tent that I got at Cabela's last year is about a 35. The search continues. While backpacking with the REI's worst tent in the world, I often dream of finding Early Winters and buying another of its tents.